Following a rough couple of games against Claremont-Mudd-Scripps and Pomona-Pitzer, men’s soccer bounced back in a physical game against Cal Lutheran Wednesday, winning 2-1 on a thrilling last second goal from junior forward Christopher Wong. The first half of the game featured back-and-forth action spanning across the field with both teams applying heavy ball pressure. 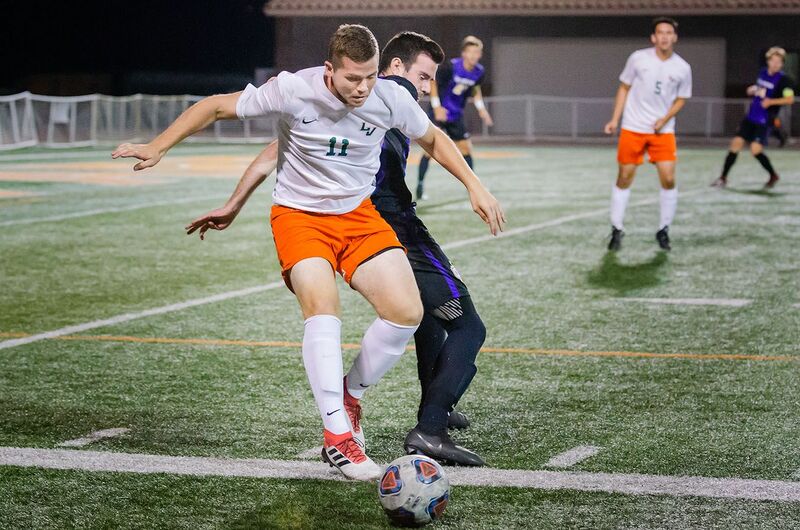 However, La Verne gained the upper hand late in the first half when Kolodge scored off of a quick pass from freshman midfielder Salvador Ortega that left defenders reeling, and gave the Leos a 1-0 lead. Despite the early goal, the Leopards’ lead would not last long, as the Kingsmen rallied back with a goal of their own two minutes into the second half. Cal Lutheran came out of halftime firing on all cylinders, playing with unrelenting aggression throughout the half. As the game progressed, it seemed increasingly difficult to move the ball through the Kingsmen’s defense. “They have a good team, and they have a really structured back line,” Kolodge said. But mistakes were rare in the second half and with the score remaining 1-1 through the end of regulation, the game was sent into overtime. Overtime started much like the rest of the game, full of physical back-and-forth action, but in the closing minutes it seemed the Leopards gained the upper hand. “They were closing us down at times, they knew how to close our passing lanes,” Wong said. Heading into the final minutes, the game was at its peak intensity, with both teams looking for their first conference win. La Verne’s chance came on a long throw in from senior midfielder Thomas McKenzie in the final seconds of the game. McKenzie’s throw sent the ball bouncing around the goal box with neither team able to secure it. But at the last remaining second Wong was able to bounce it off a defender to score the game-winning walk-off goal. With the win, the Leopards now improve their overall record to 3-2 with a Southern California Intercollegiate Athletic Conference record of 1-2. The win was necessary following two conference losses to Claremont-Mudd-Scripps and Pomona-Pitzer last week. “We knew that we had to get a win. There was no other option for us to keep going forward,” Ortega said. Moving forward, La Verne travels on Saturday to take on Whittier followed by a game on Wednesday at Redlands. These next few weeks will be very telling of how the season will play out. Currently, the Leopards sit in fifth place in the Southern California Intercollegiate Athletic Conference. Joey Matsuzawa can be reached at joe.matsuzawa@laverne.edu.